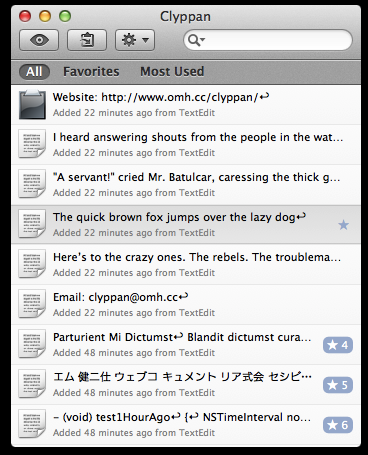 Clyppan is a clipboard manager and history app that is always at your fingertips. It keeps a list of text you have copied to the clipboard and allows you to paste it again by selecting it from the list within Clyppan. Clyppan is designed to be sleek, simple, elgant and get out of your way. Clyppan is no longer available for download. Created by Ole Morten Halvorsen. Powered by Django.